After a long day of tasting red wines, nothing refreshes like a cold beer. 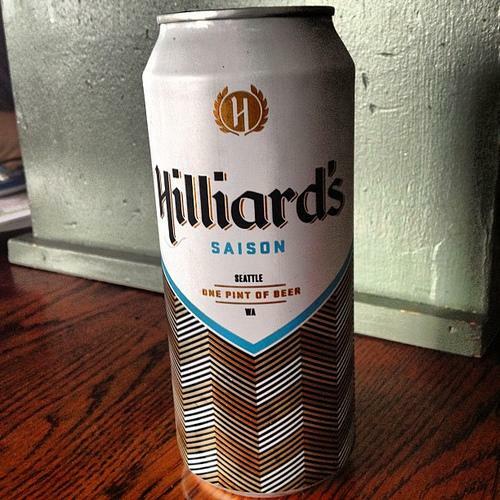 And Hilliard's Saison, made in Seattle, is going to be my summer beer. Saison is a style of beer that, according to the Beer Advocate, is a "sturdy farmhouse ale that was traditionally brewed in the winter, to be consumed throughout the summer months. Not so long ago it was close to being an endangered style, but over recent years there's been a massive revival; especially in the US." Fortunately for me, this "massive revival" is also taking place in Seattle. Hilliard's makes a great, refreshing Saison. I love the fact that it's in a can; the amount of fine craft beer you can get in a can has grown considerably over the past few years. And the acceptance of craft beer in a can reminds me of what happened with screw cap closures on wine. I have no qualms enjoying a beer from a can nor a wine with a screw cap. Cans are also much better for the environment, and keep beer fresher. It's also nice that it comes in a pint size, as a puny 12-ounce can is just not enough. I'm partial to the cool chevron design as well. This is a can that will look good on a boat, the porch, wherever. Now that I've got my summer beer, is summer here yet?